Los primeros planes de construcción de este vehículo aparecieron en 1943. Dos prototipos con torreta de Panther I se encargaron en 1944. En 1945 la empresa MAN solo había construido uno de ellos. A step-up in the world from the Pz.Kpfw. V Panther, it is best to understand you are still in the same role. While being more powerful and maneuverable than the Pz.Kpfw. V Panther, a M26 Pershing will definitely beat you in a close-quarters fight. Knowing this, it is best to take advantage of your long-range accuracy and stay just behind, or alongside, your team's heavies to avoid close-quarters combat. The Panther II has a higher profile than its counterparts, the M26 Pershing and the T-44, which means you are easier to spot, so position yourself on the battlefield very carefully. The Panther II is like a Pz.Kpfw. VI Tiger but one Tier higher and more mobile. The Panther II is a solid and capable tank in the right hands; understanding its strengths and weaknesses are the key to sucess. The Panther II isn't a brawler. It lacks both the speed and the agility to do so with any large amount of success. However, it can be a very successful flanker, so long as you pick and choose your targets. Sniping is always preferential in the Panther II over direct engagement, but don't discount scrapping entirely; the Panther II can take some decent hits, but only risk it if you have support. The Panther II works best in a pack, just like any other medium. Going out on your own will often result in finding yourself a smoldering wreck. If possible, try only to expose your turret to the enemy. Like most German tanks, the lower glacis plate is a large weakness, one which smart opponents will exploit readily if given the chance. Shots through the lower glacis will often find your engine broken and often lit on fire. It may also be difficult playing the vehicle on slopes as its gun depression is lacking. Must-have equipment for this tank are the Tank Gun Rammer and the Vertical Stabilizer to reduce reload time and drastically improve gun performance. The third equipment choice is preferential; a Gun Laying Drive will reduce aim time when stopped and help snipe more quickly, Coated Optics increase view range by 10% constantly, and Binocular Telescopes will help spot even camouflaged tanks very well, but only when the tank is stationary. Play style will determine which of these is the best for you. Although frowned upon, the Panther II, unlike its predecessor, can play a role similar to a brawling heavy, but in a way that sets it apart from almost any other tank in the game. Use the good penetration of the Panther IIs top gun to your advantage by assassinating unwary heavily damaged opponents; heavies, mediums, whatever class they may be. Learning the weak spots of tanks and where your gun can penetrate their armor will only enhance this ability. Equipping a Tank gun Rammer and Enhanced Gun Laying drive further increases the Late-game danger this tank becomes. The Panther II and those that follow it can become extremely dangerous late-game tanks in the right hands. With an elite crew, this tank can spot farther, turn and aim faster, and with its high DPM out-gun almost any other tank in its classes tier. In essence, this tank can deceptively turn into a "Medium-Heavy" late-game in urban areas in particular. Pick off badly injured tanks, weave about through streets and alleys, use plenty of cover and outsmart your foes, keep on the lookout for newly spotted targets and eliminate them as quickly as you can and you will find yourself able to completely turn, if not help turn the tide of a battle. This sort of play is very viable in tier 8 and 9 matches, but it is best you become acquainted with your Panther IIs capabilities before attempting such a feat, and is especially not advised if you have already taken severe damage. The first thing to upgrade is the turret, which gives extra view range and armor and gives more improvement than the suspension. Then research the suspension, so that you can then research and mount the L/71 or L/100. The engine does not give a very large improvement to this heavy medium, so research this last. The early impetus for upgrading the Panther came from the concern of Hitler and others that it lacked sufficient armor. Hitler had already insisted on an increase in its armor once, early in its design process in 1942. 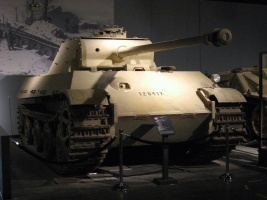 Discussions involving Hitler in January of 1943 called for further increases in armor, resulting in the tank initially referred to as the Panther 2 (it became the Panther II after April 1943). This upgrade increased the glacis plate to 100 mm (3.9 in), the side armor to 60 mm (2.4 in), and the top armor to 30 mm (1.2 in). The weapon was to remain the KwK 42 L/70Production of the Panther 2 was slated to begin in September 1943. The only remaining Panther II, located in Ft. Knox. A Panther I turret was mounted by the US army.